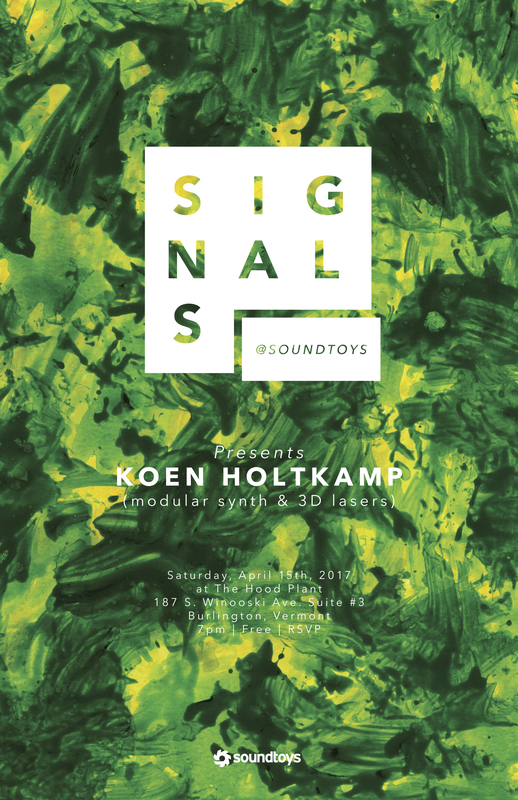 Soundtoys is proud to present SIGNALS: Koen Holtkamp on Saturday, April 15 at 7pm. This is the fourth installment of the unique experimental music & lecture series, hosted by local musician/curator Greg Davis at the Soundtoys headquarters in Burlington, Vermont. Koen Holtkamp, known for his work as one half of electronic music duo Mountains, will be bringing his modular synth and 3D laser setup for a unique and exciting performance and conversation. This event is free, but space is limited. Click here to RSVP. Koen Holtkamp (b. 1978 NL) is an artist and composer based in Brooklyn, NY. Holtkamp has released several albums under his own name on labels such as Umor Rex, Thrill Jockey and Type as well as with Mountains, a duo project with Brendon Anderegg. He has toured extensively throughout the US and Europe sharing bills with artists such as Fennesz, Loren Connors, Tim Hecker, Oval, Tony Conrad and Michael Chapman and has collaborated regularly with guitarist Chris Forsyth amongst others. He has also been included in several exhibitions, and workshops such as the Dissolving Localities Project in Jerusalem, The Substrata Festival in Seattle, WA and Doug Aitken’s ‘Song 1′ installation at the Hirschhorn museum in Washington, DC. He also co-founded the Apestaartje collective/label while studying at The Art Institute of Chicago. His current investigations include a series of objects and installations focused on composing for vibration and light as well as using electronics to resonate acoustic objects. This will be the first performance outside NYC of a new audio visual piece that incorporates 3D laser, modular synthesizer and virtual instruments.